Following the success of the 2016 show, three Broadland art and artisans return to present more works inspired by the colour cobalt in the Front Room, Anteros Arts, Norwich. 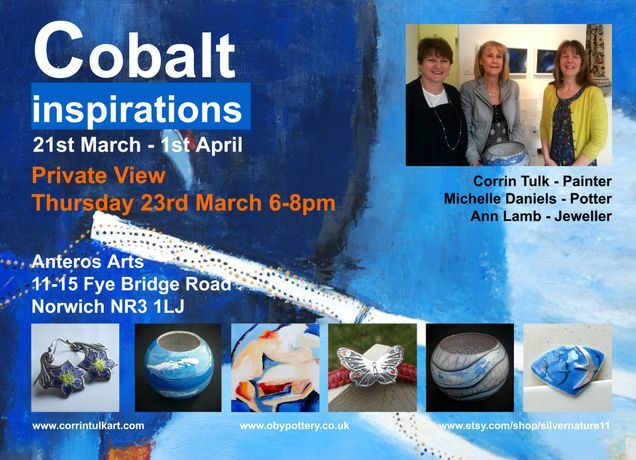 Following the success of the 2016 show, three Broadland art and artisans return to present more works inspired by the colour cobalt in the Front Room, Anteros Arts, Norwich.Corrin Tulk, Michelle Daniels and Ann lamb met through Norfolk open studios five years ago and work independently but live close to each other in the Broads, only separated by the River Bure. The three are inspired by each other’s continual ambition to develop and try new techniques in their practices’ and their drive to survive as self-employed artists and love what they do. Corrin Tulk is passionate about creating bold, abstract oil paintings that reflect the spirit of a place. She is interested in coastal landscapes and sacred, ancient pathways and her paintings often feature a predominance of Cobalt colours. Corrin’s paintings are inspired by natural elements and memories arising from walking meditations along various coastlines. She often collects stones on Caister beach imbedded with marks /fossils similar to tracks or pathways and uses these as a starting point. Oil paint is applied in layers to create depth and contrast. When it suits an abstract, she adds small dotted lines alluding to the concept of the Indigenous Australians ‘Songlines’ or ‘dreaming track,’ providing a subtle reference to her birthplace, Perth. Visitors are welcome to visit her home gallery in Upton near Acle by appointment throughout the year. Inspiration for Michelle Daniel’s current work comes from an interest in the surfaces of the planets in the solar system: recent images from the International Space Station and from the “Otherworlds” photography exhibition at the Natural History Museum have inspired both form and surface in her work for this exhibition. She says “The use of ‘Cobalt’ made planet Earth the obvious choice for my studies”. Forms are wheel thrown before terra sigillata slips stained with Cobalt oxide are brushed & mono-printed onto their surfaces. By mono-printing she aimed to portray surface texture in a two-dimensional way as would be seen from space. Some of the vessels were then burnished, some glazed before raku firing to approximately 950°C. Michelle has a small home-based gallery and kiln in Oby and is often open during the summer months for visits or other times by appointment. Ann Lamb loves to design nature inspired jewellery in silver and gold with enamels and gemstones. She is fascinated with pattern and colour combinations and likes a bit of ‘sparkle’. Since graduating from college in graphic design and typography, she has undertaken projects for many wildlife organisations in information and interpretation. As a result of this work she likes to incorporate this sensitivity in her jewellery and hopes to promote interest and caring towards nature. The challenge and pleasure for her is to transform what she sees in nature in to a unique and special piece of jewellery. Quirky details and inscriptions appear on the reverse of her work for the wearer to either share or not, so do take a look on the rear side too! All of Ann’s jewellery is designed and made in her home based studio in Thurne, which can be visited by appointment or check out her Etsy website.